Title photo courtesy of Gene Mirro. Copyright Gene Mirro, all rights reserved. Used with permission. Photo inset #1 is of a close up of L. lijiangense as flowered and photographed by Rimmer. Copyright Rimmer de Vries, all rights reserved. Used with permission. 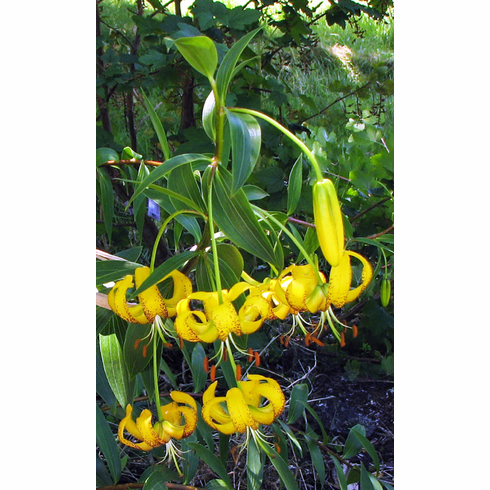 Photo inset #2 was submitted by Gene Mirro of a "clump" of L. lijiangense as flowered and photographed in June of 2012. Copyright Gene Mirro, all rights reserved. Used with permission. Photo insert #3 shows a very different form of 'L. lijiangense' which is how new names get attached to recognized species such as 'L. ninganense' or 'L. huidongense'. Explorers anxious to find and name a new species often overlook color and spotting variations between colonies separated by a valley or mountain.